Welcome to the first installment of Novellas for Monday, a series where we plan to highlight a novella every Monday (or, realistically, some Mondays now and then). These will not necessarily be full reviews, they may just be a nod in the direction of a novella we found interesting. Our first selection is Ourika, available here in the original French, and here in English. Ourika is a 1823 novella by Claire de Duras, inspired by the real story of a black girl from Senegal living in the Paris high society around the time of the French Revolution. The story is narrated in first person, by a young doctor who meets and treats Ourika (to the reader) and by Ourika herself (to the doctor). 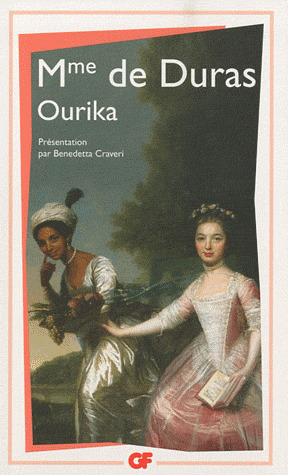 Ourika's entire family was enslaved when she was very young, and a French nobleman took pity on her and took her back to Paris with him. He placed her in the care of his sister, madame de B., who raised her with kindness and devotion, giving her access to the best society and education that noble girls could hope for. Ourika is told about her origins, but has no memories of her life before Paris and is fully committed to her life as madame de B's protegee. She grows up happy, friends with madame's sons, appreciated by the Parisian society for her wit and taste. As a teenager, she becomes aware of the difference between her and her peers and of what this difference means for her prospects. She learns that, because of her skin color, she will never be accepted as an adult in the high society that found her entertaining as a child. As she realizes that she doesn't fully belong anywhere and sees as inevitable a life of loneliness, of never being loved, she succumbs to despair and becomes "sick with melancholy." The Revolution allows her to hope again: in the general chaos and turmoil, societal distinctions seem less important, and Ourika glimpses a world that would have room for her. During the Terror, solidarity in the face of death and loss brings Ourika closer to the family, and she even falls in love. Her melancholy fades and she has a vague indistinct vision of a happy future. But as the Terror winds down, Ourika must face the fact that society is rearranging itself. I admit, I didn't imagine I'd be writing this post today. I've been a bad blogger and infrequent reader these past weeks and I had trouble imagining myself crawling out of my reading slump/procrastination hole anytime soon, so signing up for a reading event didn't sound like the wisest of ideas. But then again... Reading events are fun. Adam's reading events, especially so. So here I am, ready to try out some stuff from the Beat Generation for The Beats of Summer. 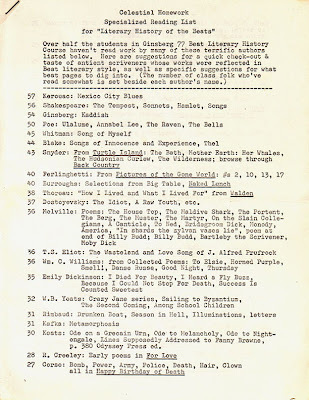 My favorite syllabus/reading list so far is this one, although there are a lot of awesome resources online about the Beat Generation. (For example, this page provides a helpful list of other syllabuses and resources for teaching Beat literature. Adam has a list of writers, important works etc. in his post announcing the event.) 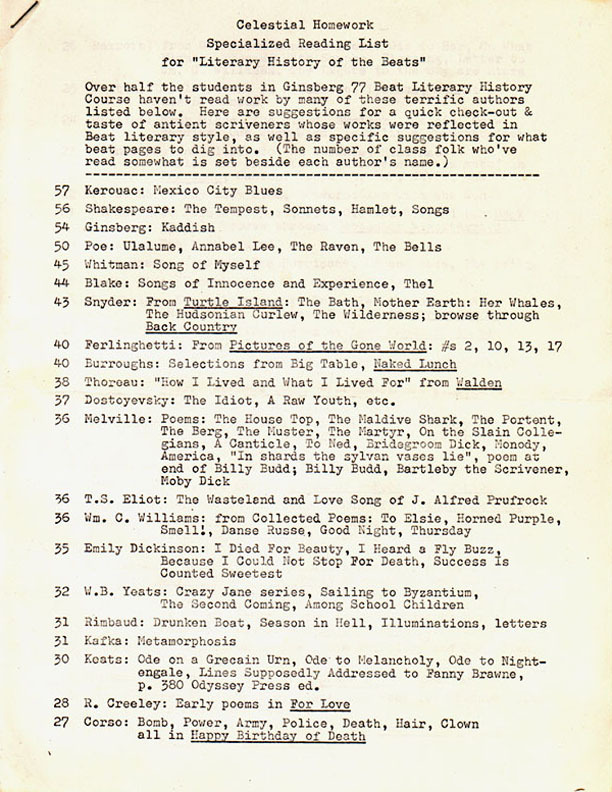 But then I stumbled across something even better on Tumblr, and I think I will start with that: the Celestial Homework, aka Allen Ginsberg's reading list for his class "Literary History of the Beats." The first page of it is below, and the rest can be found here, as normal text, or here and here as pictures of the typewritten syllabus. Now, since, per Ginsberg, this reading list includes "suggestions for a quick check-out & taste of antient scriveners whose works were reflected in Beat literary style as well as specific beat pages to dig into," I think I will actually start reading before June 1st, when the official Beats of Summer event begins. In fact, I think I'll start reading today and hopefully cover a few of the classics on that list. So... grab your books and join me?